GRANDMA KAT’S 30 YEARS OF GARDENING EXPERIENCE AT YOUR FINGERTIPS! Are you looking to start an organic garden of your own but aren’t sure where to begin? Have you been pounding the dirt (no pun intended) and not getting the results you hoped for? If this sounds like you, then get ready to step into Grandma Kat’s world of gardening where I teach you the tips and tricks that yield beautiful organic gardens each and every time. 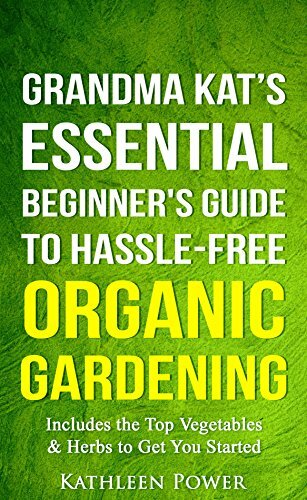 This book contains proven steps and strategies on how to start your own organic garden with the help of expert tips and advice to get you started. I’ve been gardening for the past 30 years in many different environments. Country gardens, city gardens, urban gardens, even patio gardens in my apartment – you name it, I’ve done it. Through all of my experience, I’ve never found more success than when I was staying true to my organic practices. My vegetables were better, my herbs were more aromatic, my fruits were sweeter – all because I took the time to make sure everything I was doing was as natural as it could be. Sure, you can get by easier with many products currently on the market. Fertilizers, mulches, pesticides, etc. There’s an inorganic alternative to basically everything you need. However, this is only going to hurt you in the long run. Instead of taking the easy way out, it’s important we understand how to grow our gardens in an ethical and organic manner. You will not only feel more fulfilled, but you will also be travelling down a path you can be proud of. We must respect our bodies and what we put inside them. There’s no better place to start than from the ground our food is coming from.